Sam is 6 year old Flame Point Himalayan. He was an abandoned and malnourished kitty outside in a rare snow in Louisiana on Christmas Day. When we found him in the snow, he was dehydrated and starving. After we fed him we had to bathe him, he was so dirty. With all the fluff we couldn't see that he was so flea bitten that his fur was actually stained with blood spots until the bath. He likes to sleep on anything fluffy and soft, sleep with a small stuffed toy yellow duck, play with his adoptive sister kitty Celie, to get petted, watch the birds at the bird feeder and watch Catnip DVD. If you put a treat in your hand, he will tap your hand with his paw to get you to drop it. We didn't even teach him that, he just did it all on his own. He is a cute cat; lucky you found him and cared. You got my vote. This cat is so beautiful and cute. Such an adorable baby you have. 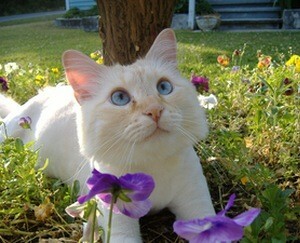 Very pretty cat & a great picture. Sometimes I think animals know where to go for help and he found the right people! I am so glad there are people out there like you! He is a beauty. Thank you for saving him. I will never understand how people can be so cruel for leaving him out like that. It's their loss. What a handsome animal. Daddy save's cats too that have no home. Problem is that he does not want them to go to another home. He keeps them all up to date with their vet bills and feeds them twice a day (canned food) dry food is out all of the time with fresh water. At last count he had 3 neutered males & two spayed females. They are his furry babies and your Sam is gorgeous!